Now this surprised me for several reasons. First, I was surprised that Mark would be so willing to abandon the novel we’d been working on for almost a year so quickly. Second, at the time Mark had a lot of issues with religion. He’d had some bad experiences when he was younger with the church (I won’t go into specifics or start name dropping denominations) and I think it would be fair to say he was a bit bitter about it. Being the Holy-Rolling-Bible-Thumper I was at the time, we’d had our share of lively discussions on the subject up until that point, so to have Mark say that not only did he love what I’d written but that he wanted to help me make it into a real novel, it blew me away. Well, it didn’t just become a novel- it became a whole series. Over the course of the next decade we not only wrote the rough draft of the novel that you’ll hopefully be reading very soon, but we also mapped out a full trilogy of main novels, with several spin off novels, short stories, and concepts. It was our first real novel and we were being perfectionists with it (I lost count of how many versions and drafts we ended up with). It didn’t help that we had work, school, our personal lives, and over 1000 miles of distance between us to complicate things. We finally had the thing done and Mark was going through and putting his final touches on the last few sections I’d written to end the novel when he died. Needless to say I was devastated and it took me a couple of years to get to the point where I could seriously work on the thing again. I had already shopped it around to tons of agents before, but once Mark died I decided that the best thing to do would be to self publish it. I was worried that if it did get picked up by a publisher they would want me to make changes. That’s to be expected. However, the book as it was is the version that Mark and I did together, and I didn’t want to make any major changes without him. I didn’t want to lose anything that he had written. My cousin Cathy volunteered to lend her expertise to editing it. Shawn, one of Mark’s closest friends in PA, and I had grown very close after Mark’s death, and he volunteered to help lend his artistic talents to help get the various projects Mark and I had worked on off the ground. As you can see from the image above and the last two “test books” we’ve put out in the last couple of months, he’s incredibly talented, and I’m incredibly lucky that he’s working with me. The unedited version of the novel ended up clocking in at 128,789 words. That’s not too incredibly long for a fantasy novel, but when you’re doing it through print-on-demand a manuscript that long becomes incredibly expensive to publish in paperback (for those of you who like to rock it old school). So, we decided to break it up into two parts, the first of which will be available soon. The goal was to tell a story that anyone, regardless of their beliefs, could pick up and really enjoy. We made sure to have it test read by many different people with different religious backgrounds, genre preferences, ages, and so forth to help ensure that it could appeal to the widest audience possible. We wanted this to be our Star Wars, our Lord of the Rings, our Dune Chronicles. Hopefully we succeeded. Now it’ll be up to you to determine how well we did. There has been a war raging between Heaven and Hell for the fate of all creation, and the forces of Heaven are losing ground. 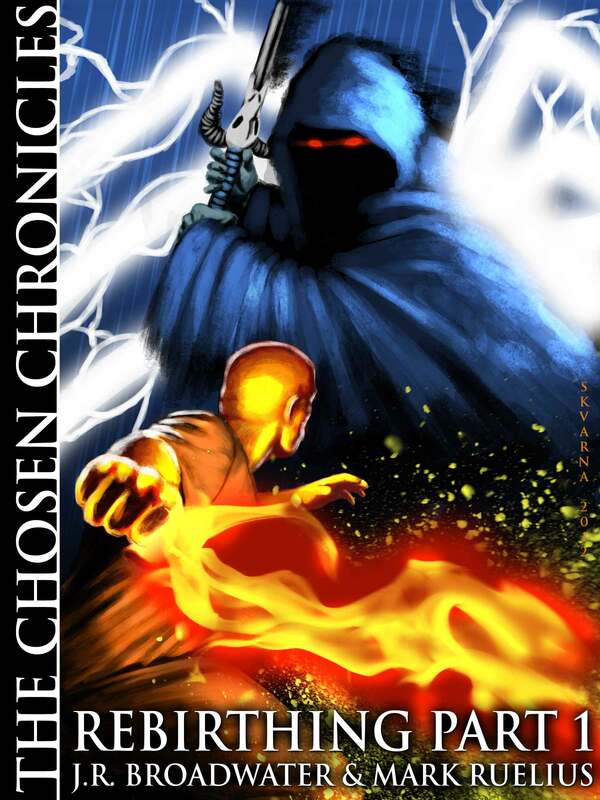 The Enemy has discovered something that may tip the balance of the war in their favor, and now it’s up to Jude, the absentee leader of the warrior-priesthood known as the Chosen, and his new trainee Paul, to rally the disjointed forces of Heaven on Earth and find the source of this new threat. If they fail, it will mean that the forces of Hell will be free to run rampant across the Earth, ultimately leading to Armageddon and the end of all things.